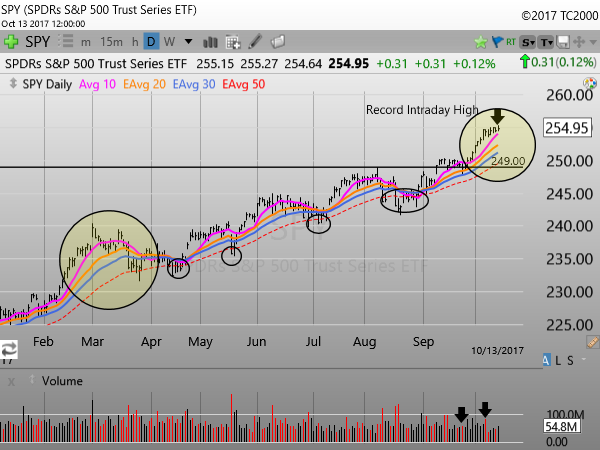 The markets confirmed uptrend remains in tact with the major indices trading fairly quietly this week as earnings season is underway. How long will this quiet, orderly move up in the markets continue? Truth is, no one knows, but we are always on the defensive here at TTP as there in never a time for complacency in this game and there is currently a fairly good amount of that in the markets right now. We still need to be long because that’s what the trend is telling us, but it is by no means a license for recklessness. 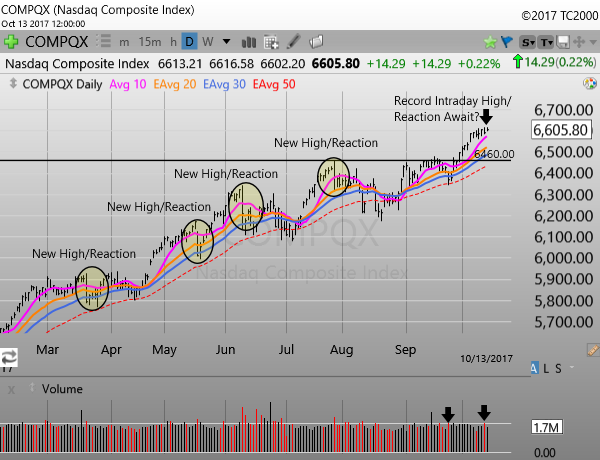 A look at the Nasdaq Composite chart below will serve as a good reminder of how markets more often trade and perhaps what we may expect it the days and weeks ahead. Continue to take swing trade gains when profit targets are hit and move stops up on the remainder of those shares to breakeven as we did with $ICHR this week. We currently have six trades on and all are long positions. Of those, three are still full positions while the remaining three are in trend following mode since having booked swing gains previously. With that, lets take a more detailed look at the charts starting with the indices before moving on to our open trades. NASDAQ- This week we begin with the Nasdaq Comp as it shows a great picture of what we briefly touched on in our open today. The chart shows that the index made new highs in March, May, June and late July and on each occasion it was hit with a reaction that ranged from roughly 2.5% to as much as 4.5% in July which ultimately triggered a shallow two month corrective period. We don’t make wild predictions here but we are always monitoring the market landscape so when inevitable periods volatility and corrective behavior hit the markets we are better prepared to react to it. As far as distribution is concerned, the index looks good with only two such days in the 20 session count. SPY- The S&P 500 quietly notched an intraday record high on Friday before pulling back and narrowly missing a record closing high. Like the Nasdaq, the index shows only two days of recent distribution and currently sits 2.2% above its 50 day EMA. Back in March, the index traded 4.5% above that moving average before pulling back and ultimately testing that line on multiple occasions on the way up as the trend continued. As daylight increases between closing prices and the 50 day EMA, the odds off a pullback may increase as well. 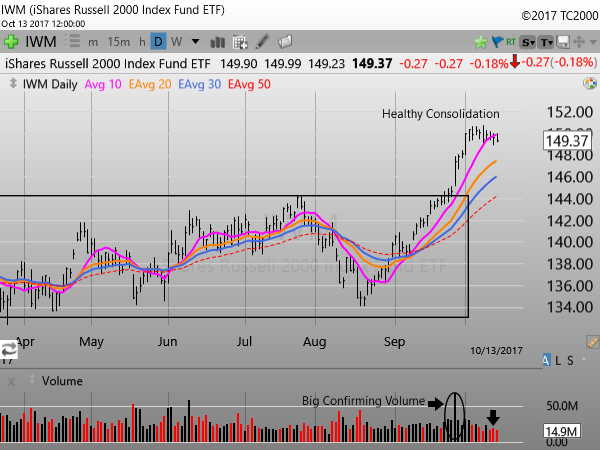 IWM- Action in the Russell 2000 continues to look healthy. The index has been consolidating the 11% gains it has racked up since mid August in constructive fashion. It registered only its first distribution day this past week since September 5th. Should the index continue to consolidate those gains in the days ahead, you can monitor the health of that consolidation by watching for mounting distribution days. For now, all looks good here. 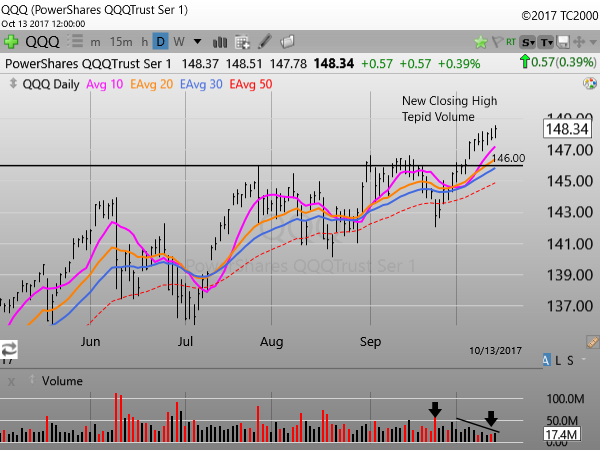 QQQ- Of the four major indices we track here, the Nasdaq 100 has the most to prove. Although the index has now broken out along with the others, the lackluster volume on breakout day along with the decreasing volume on the move higher since, leaves a shadow of doubt over the legitimacy of the move. That said, the index did close at an all-time high on Friday so it gets the benefit of the doubt for now. Now on to our open positions. SEDG- For those that have been with us you know the story well. Long since mid July, we booked gains of 9.32% and 28.59% and are currently holding a quarter of our original position which is now up over 37%. The stock knocked on the door of a breakout to new highs on Friday before stopping just short and settling for a new closing high of $29.55. Perhaps next week we can break through the ceiling, we shall see. 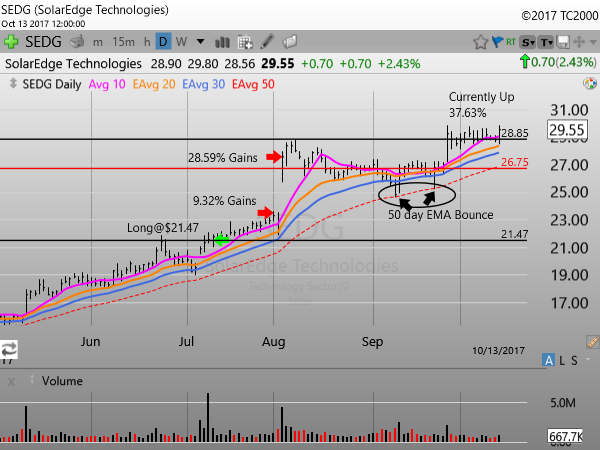 In the meantime we nudge our stop up to the 50 day EMA near $26.75. 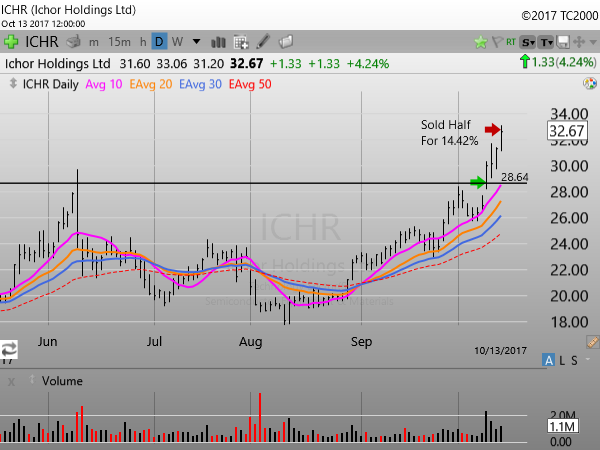 ICHR- Our newest trade we put on this past Tuesday is in Ichor Holdings, a stock in the red-hot semiconductor group. We were already able to take swing gains on the first half of our shares on Friday, only four days into the trade. We try to time up all our trades best we can but as we like to say, sometimes you get paid quickly, sometimes you get paid slowly and sometimes you don’t get paid at all. Our swing trade Friday netted us 14.42% on the first half of our trade and we are now in trend following mode with the balance of our shares. Seeing that, we move our stop to breakeven. GILD- Long since 7/13 we are in trend following mode with the second half of our shares after booking modest swing gains of 4.59% which was short of our original target (this was due to pending earnings which required us to sell half our position). 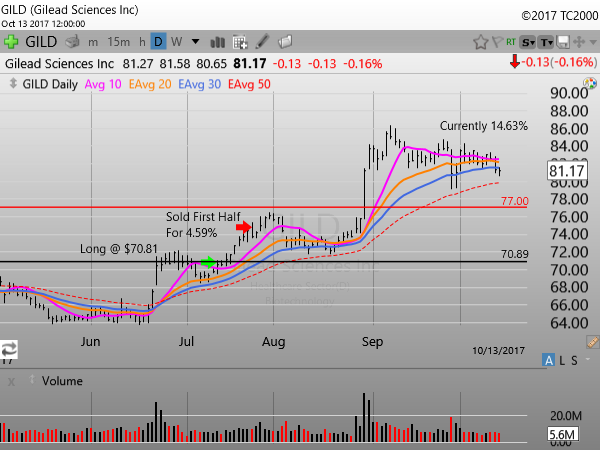 The stock has been pulling back since reaching a high of just over $86.00 in early September and closed on Friday at $81.17 leaving us up over 14% on the balance of our trade. We are left with nothing to do except follow the plan. We leave our stop near $77.00. 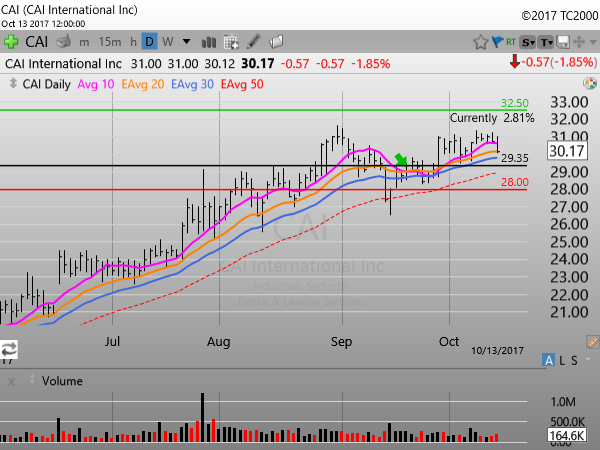 CAI- We opened a long position here on 9/20 at $29.35. The stock has moved slightly higher for us since but did pull back a bit on Friday closing at $30.17 leaving us up 2.81% three weeks into the trade. The stock is battling some resistance near $31.00, hopefully it can push through that soon. We have moved our stop up here to near $28.00 should the stock roll over. 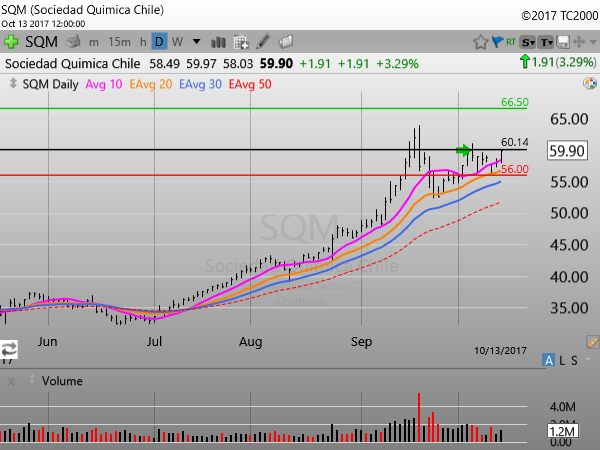 SQM- We opened this long trade on 10/5 at a price of $60.14 and the stock pulled back almost immediately afterwards trading as low as $56.36 but did recover this week to close at $59.90 leaving us down on 0.40%. We still like the potential here but we did nudge our stop up to near $56 from $55. 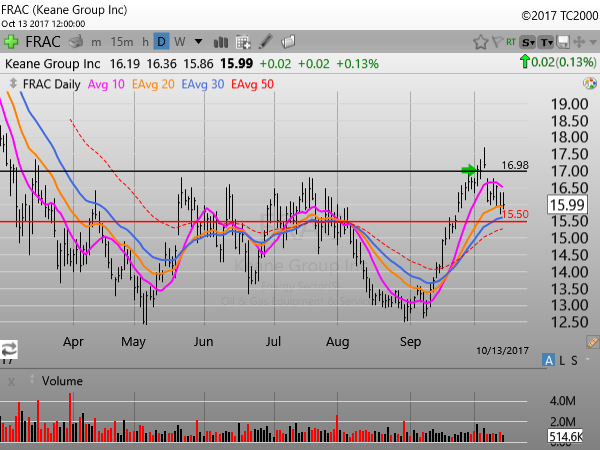 FRAC- Finally we have Keane Group an oil equipment stock that we initiated a trade based on a Trend Transition set up. The trade got off to a fairly good start out of the gate but was thrown back after and analyst downgrade. We opened the positon at a price of $16.98 and with a closing price of $15.99 on Friday, we are down 5.8% thus far. Commodity based stocks can offer bumpy rides so no reason to think this was going to be different. That said, we are close to our stop price of $15.50 so be on the watch next week. That’s all for now. Enjoy your weekend and be careful out there!